Good food :"My pug likes this food and enjoys the taste." 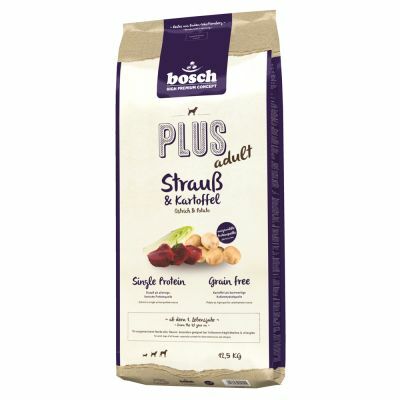 bosch HPC Plus Ostrich & Potato is a complete and balanced dry food that is excellently suited to dogs with sensitive digestion, or those that have food intolerances or allergies. With a single source of protein, it is also ideal for dogs whose digestion reacts to eating more than one type of meat or fish at a time. The kibble contains potato, which is easy to digest and acts as a good source of carbohydrate and energy. No grains have been added, as dogs with sensitive digestion can have trouble digesting grain or react badly to it. Ostrich is a quality source of rare proteins and has a strong flavour that dogs love. It is also less likely to cause allergic reactions than other meats. Glucosamine and Chondroitin can help to build and maintain cartilage, and strengthen bones. Chicory provides prebiotic Inulin, to help to support the intestines and balance gut flora. 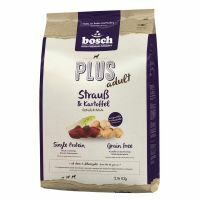 The premium ingredients have been produced and carefully processed in the Baden-Württemberg region of Germany, making bosch HPC Plus Ostrich & Potato a high-quality, natural dog food, that will provide your dog with all of the essential nutrients it needs. Careful manufacturing processes: To help to preserve nutrients, vitamins and proteins, ensuring the product is easy to digest. bosch dry dog food only uses carefully selected ingredients (including poultry, whole egg, beef, lamb, vegetables), that are carefully processed to produce tasty, wholesome, digestible, high-quality dog nutrition. The animal proteins in our foods only come from animals that have been declared fit for human consumption. A mixture of naturally occurring tocopherols have been added to bosch dry dog food, to help to conserve delicate yet essential vitamins and fatty acids. You can rest assured that with bosch quality dog foods, you will always be able to find the right nutrition for your dog’s needs. Potato flour, ostrich flour (min. 12%), potato protein, peas, poultry fat, dried beet slices (no sugar), protein hydrolysate (from plants), dried yeast, dicalcium phosphate, sodium chloride, glucosamine, chondroitin sulphate, chicory powder. Vitamin A (12000 IU/kg), vitamin D3 (1200 IU/kg), vitamin E (70mg/kg), zinc [as zinc oxide] (70mg/kg), zinc [as amino-acid chelated zinc hydrate] (75mg/kg), copper [as copper II sulphate pentahydrate] (10mg/kg), iodine [as anhydrous calcium iodinate] (2mg/kg), selenium [as sodium selenite] (0.2mg/kg). 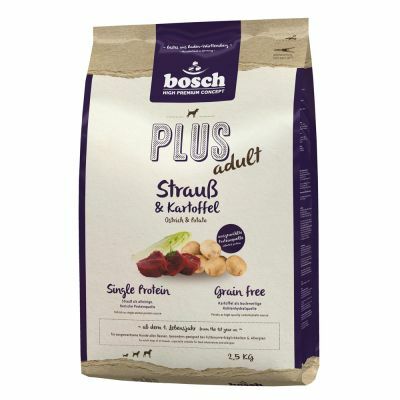 Bosch HPC Plus Ostrich & Potato is a complete dry food for dogs. Can be used in dried form as well as moistened with water. My pug likes this food and enjoys the taste. Only limited suitability for small dogs as the kibble is very hard. After a week my chihuahuas refused to eat it. We are staying with Africa Mini. My Parson (10 years old) had really big stomach problems 3-4 years ago. We started using Ostrich & Potato as an exclusion diet. Initially I wondered about the increased amount of stool (5-6 times per day). It had positive effects such as a bit of weight loss :-) Meanwhile (after 2-3 months) the amount of stool is back to normal (as is the weight unfortunately). She has shiny fur, which I have never had trouble with. My dog is intolerant to cereals and we have tried various 'grain-free' kibbles with varying success. She really seems to like the taste of this one though and it definitely suited her delicate tummy. For a 'grain-free' dog food, the price is very reasonable too.